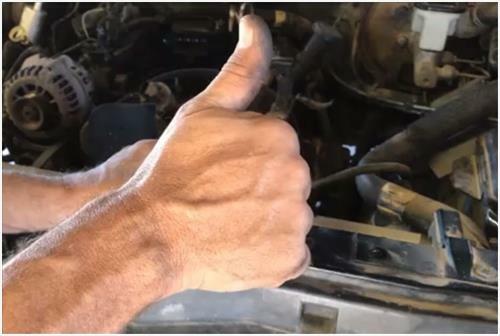 In most cases when working on any vehicle the key is not only to know what you are doing, but to have the right tool for the job. In my experience I have pulled, bent, and even broke these pulleys trying to remove them. Having the right tool not only save you time, but it can save a lot of frustration. 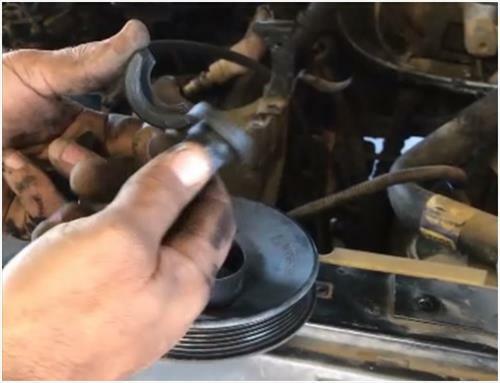 The Performance Tool W87022 GM Power Steering Pump Pulley is my choice of tools for this job. 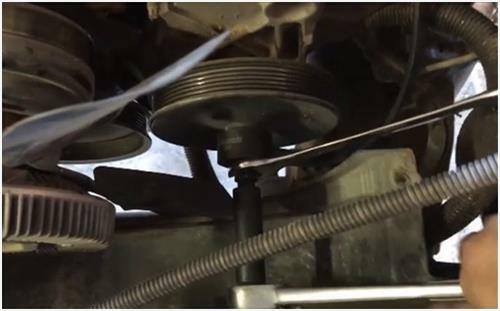 No more prying or bending parts and tools to remove your power steering pump pulley. It will also work on a number of other pulleys as well. The tool is very inexpensive and comes with five components. First thread the bolt into the nut with the large flat washer side of the nut pointing away from the bolt. You will notice the two identical clamps will have a small side and a large side of clamping surface. The large side will rest against the inside of the nut, while the smaller of the two sides will rest on your pulley that you are removing. In order to show you best here in this picture the pulley has already been removed. With both clamps (small side toward the pulley) and bolt and nut into place. 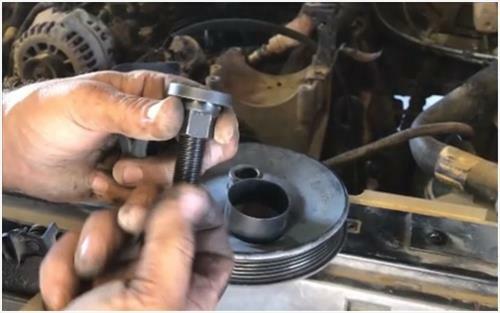 You know slide the clamp ring over the bolt, nut, and clamps. 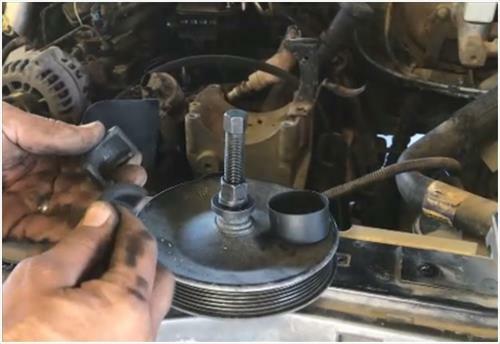 As you tighten the bolt, you will need to place a wrench on the nut and hold it into place. With very little effort the pulley will slowly slide off. The entire process when assembled correctly takes approximately 3-5 minutes to complete. 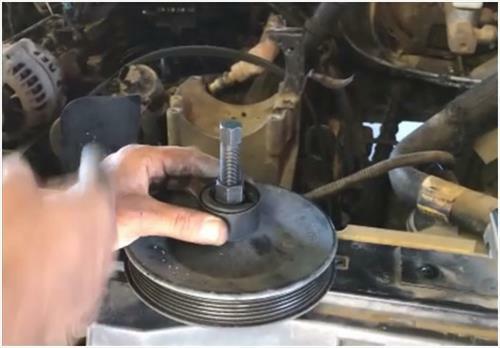 Good job, you have removed your power steering pump pulley yourself with very little effort. 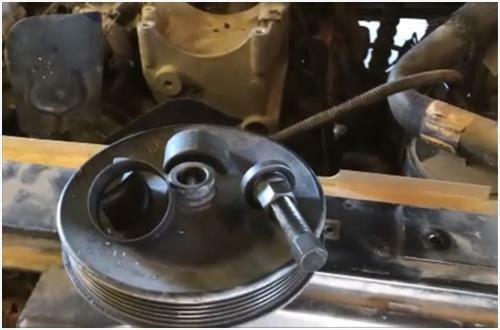 Here is a quick video showing you in detail exactly how the power steering pump pulley removal tool works.